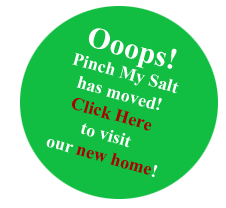 Pinch My Salt | A Place for Food. Once you get to the new site, please bookmark the new address so you don’t miss out on any of my upcoming posts! This old site will not disappear but I will not be updating it. And don’t worry, I’ve moved all of my recipes and older posts to the new site! And to the new readers who have arrived here thanks to the mention in The Sacramento Bee, welcome! So without further ado, let’s head on over to the new site and see what’s happening! Are you ready? Are you sure? Ok, now close your eyes…wait, you’d better keep them open. Oh what the hell, just CLICK HERE! Any Foodies out there using Twitter? If you are interested in what I’m doing every second of the day (it’s usually food-related), come find me here! I have noticed that I am not the only one who has been enjoying fresh strawberries lately! I will be posting a homemade strawberry shortcake recipe soon and thought it might be fun to add some links to other fresh strawberry recipes that are floating around the blogosphere right now. So, if you have recently posted a fresh strawberry recipe or plan on doing so this weekend, send me your link in the next couple of days and I’ll include it in my strawberry recipe round-up! I would really love to see some fresh strawberry pie recipes — I’ll be making one as soon as my aunt tracks down my mom’s old recipe! Hey everyone! It’s time for a little shameless self-promotion!